Born Feb. 12, 1922 in Kansas City, MO, Smokey Smith landed his first radio job as a singer and guitar picker for Ted West and his Range Riders in 1938 at WREN in Lawrence, KS. He went on to California in 1940 where he had live and deejay shows on KYOR in San Diego. Smokey and his band, The Gold Coast Boys, cut transcribed shows in San Diego for XERB in Rosa Rita Beach, Mexico and other Mexican stations including XEG in Monterrey. He recorded for a time for Crystal Records. 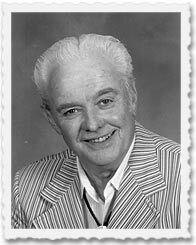 In 1949, he went to work at KRNT in Des Moines, IA where he continued doing live and deejay shows plus making personal appearances with his band all over Iowa and throughout the Midwest. Smokey began booking country and Grand Ole Opry shows at the KRNT Theater in Des Moines. Seating 4,172, the once-a-month bookings ran from September through May. (The theater wasn't air conditioned, so it was impossible to do shows in the summertime.) Smokey then branched out by booking additional dates in civic auditoriums in such cities as Rochester, Minneapolis and Duluth, MN, Madison, WI, Cedar Rapids, Waterloo, Davenport, Sioux City and Burlington, IA, Fort Wayne, IN and Denver, CO. Smokey booked Johnny Cash, Waylon Jennings and Charley Pride on some of their first concert dates. For more than a year, he booked the country shows at the Erie Crown Theater in the McCormick Place in Chicago for WJJD. He had Buck Owens booked in there when the McCormick Place burned to the ground two weeks prior to the date. Smokey was able to switch venues to the Civic Opera House where it sold out. Smokey had the first commercial live country TV show in Iowa on KRNT-TV in 1953. He also worked as a country deejay at KWDM in Des Moines, KNIA in Knoxville, IA and KWKY, Des Moines. He served as a board member for the Country Music Disc Jockey Association, which later became the Country Music Association. Smokey was nominated for the Country Music DJ Hall of Fame in 1981, but was beaten out by Charlie Walker. Nominated again in 1982, he and Bill Mack tied for the honor and both were inducted. President, Country Radio Broadcasters, Inc.
Sign up for our Radio information list!